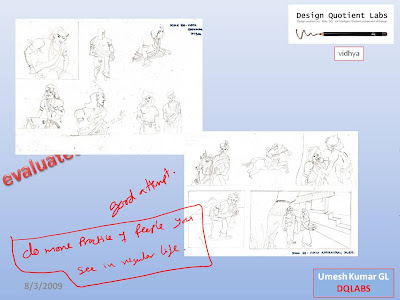 Go through all the feedback you have got on your sketches from day 1. list down what you have understood in the feedback under the 3 heads - 2d composition with coloring , 3d composition and theme sketching. go through the work of meher bhagia, sruthi singh, dinkar and write down what you like most in each of these students sketches. send me the write up. 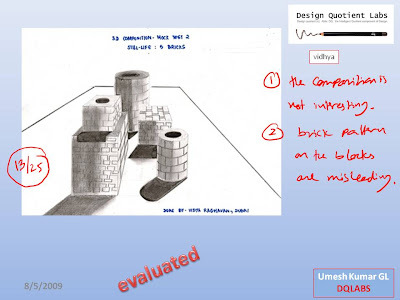 correct your sketches and attempt mocktest 6. 1. imagine that the size of the coconut tree is reduced to the size of the rose plant and viceversa. Draw how they would look in their new assumed form. 3.you are ant walking through a pile of vegetables. Draw what you see. redo the primary school logo. 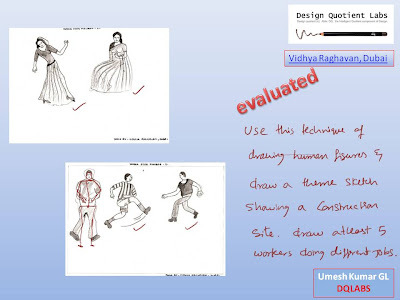 Correct the sketches as per the feedback. design a logo for a beach side juice and snack bar. 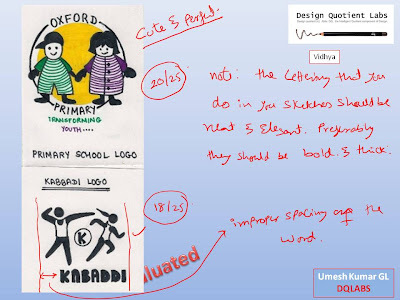 design a logo for a primary school. tips - make the logo contextuallty relevant, attractive, simple and meaningfull. 3)3D- draw a stable composition using 5 bricks. Here is the first mock test question for today. Dont bother about the time. do a good job. i want to see some WOW sketching stuff. Implement all the concepts you have learned in the past 9-10 months. Do not copy from any photographs or sketches. It should be your visualisation. submit the sketches by end of today. 1)Your a baby and your mum is giving you a toy (your in the cradle). Draw what you see . does the new account working better now? 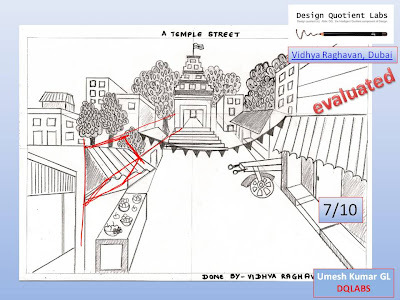 draw the perspective assignments sent to you. for human figure drawing. 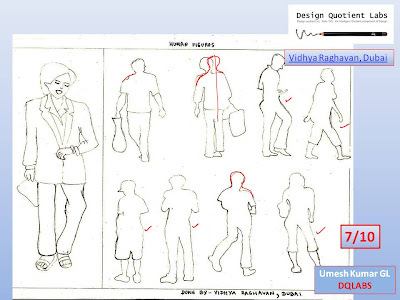 do extensive practise by drawing human figures from magzines and comic books. practice certain common postures very well such that you can draw them easily in your exam if required. 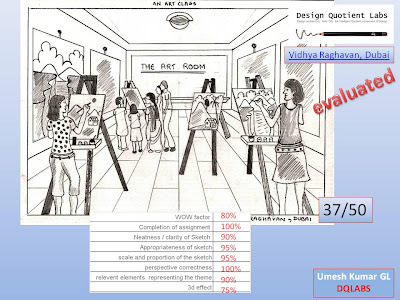 correct your sketches as per the feedback and also do the human figure drawing assignments sent to you by email. Redo the sketch as per teh feedback and attempt the exterior views. Now lets do little larger views. i have sent you some assignment . first submit the interior views after you get feedback do the ecterior views. redo the ants eye view sketch. follow the feedback and submit the sketches. Draw nd submit hte object i have send thru mail. i will send you next assignment by email. please check it. 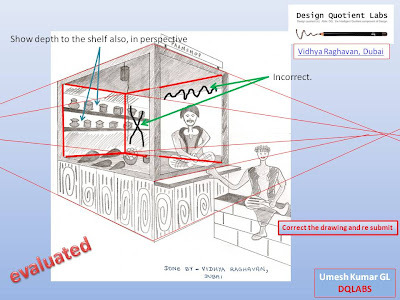 correct the mistakes and resubmit the respective sketches. 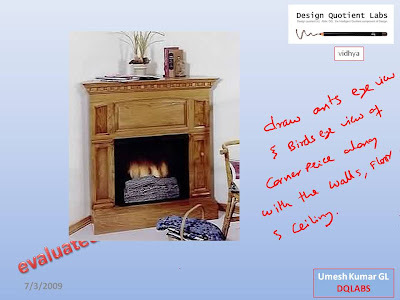 correct your ants and birds eye view drawing and send them. 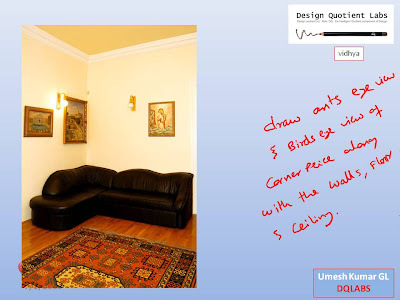 Practice drawing birds eye view and ants eye view of various bojects found in your home. send drawings of atleast 10 objects. 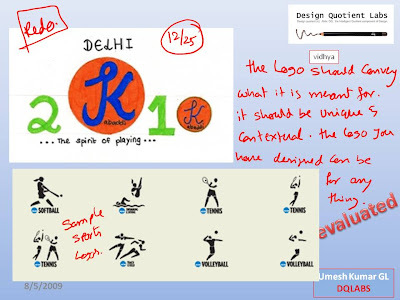 Note- pls submit your sketches before 5pm IST of each day to get quick feedback. 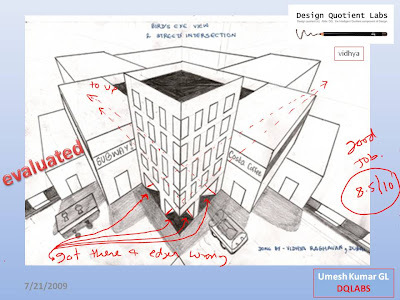 i have sent you some assignments on basic perspective drawings. submit them. Task 1-imagine 2 tea cups along with saucers and a tea pot is kept on a cofee table. draw the shape of objects as it would look from top. color the teacup in in red to yellow gradation and tea pot in blue to yellos gradation. Task 2 redo the incorrect sketch. Task 3 i have send you some shading exercises. follow nad submit them. 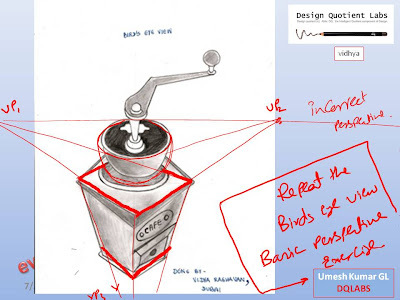 Use the technique illustrated below and create sketches for other 9 objects. i will send you some 3d compositions. try to replicate any 2 of the as close as possible. 2d composition is very good. will send you some reference drawings on 3d drawing. study them well and make a composition with a cube, pyramid and spehre exposed to spot light. create light and shadows. good job. Let me know if you are facing any specific problem in drawing themes. for the next assignment draw a busy temple street. submit it by 24th feb.
submit your theme sketch when you are alright. 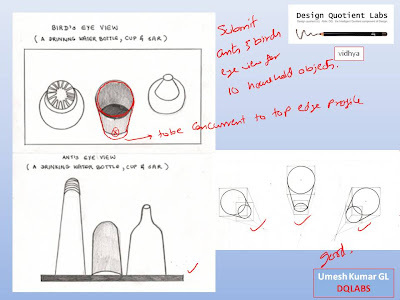 draw a theme sketch on artclass and submit it by 3rd feb.
correct the mistakes in 3d assignments. 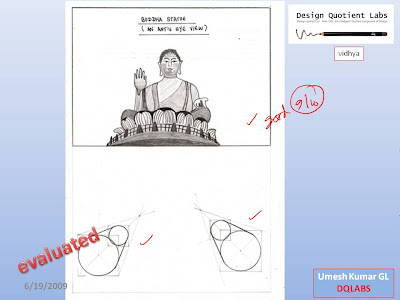 study the online material and books about 3d drawing thoroughly and correct the mistakes. 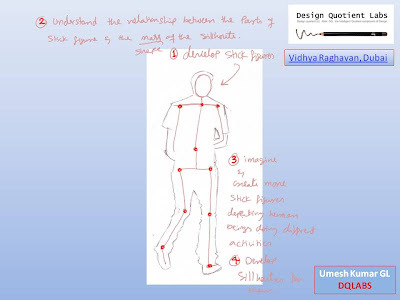 Dear Vidhya, Submit your drawing by 19th jan. your 2d-3d visualisation submission feedback would be given by 20th jan.
your next submission- is to generate 5 stick figures doing different activities. draw well proportioned human sillhouts corresponding to the stick figures. 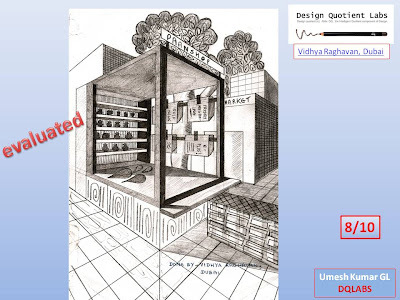 submit this by 5th jan.
nice.. as a next step lets start with drawing human figures. i will send you an image by mail. draw the people as shown in the image. give due attention to the detailing and proportion of the human figure. you dont have to shade it. choose on of the images from above and sketch it. 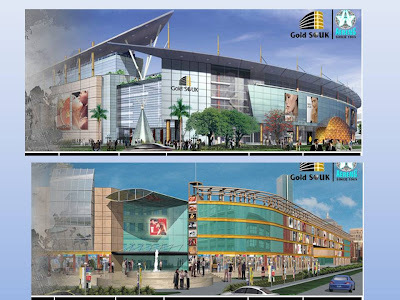 submit the drawing by 31st dec.
i suggest you to do a google image search on malls, nadselect some pictures that show a shopping mall with simple yet striking form (example -as shown above.) observe all the visual elemnts that would signify the building to be a mall. submit the selection of images by 29th dec.
your building sketch is more suitable for a heritage building rather than a mall, though in reality it is used for a mall. Implement the feedback and submit it. do the corrections and also detail the texturing referencing the images i have sent you by mail. submit the drawing by today evening. i like your style of drawing. please implement the above feedback and submit the drawing by 20th dec.
we will have seperate set of exercises for drawing human beings. so you can learn it that time. first focus on perspective and environment sketching. 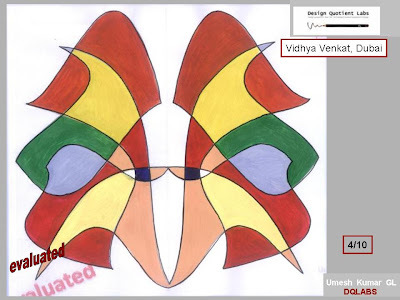 Dear vidhya, good work, but you need to get hold of 2 point perspective yet. what ever method you have described is the correct one. beginners do it like that. after some practice you will be able to visually assume the vanishing points and draw the perspective lines. it comes from rigorous practice. but for now you are on track. keep going . correct the drawing and draw the shelfs in perspective. submit the drawing by 10th dec.
good job. can you use the same concepts and correct your pan shop drawing? the perspective is a little incorrect in that sketch. submit the drawing by 8th dec.
i have sent your next assignment by email. please check you mail box. recolor all the four drawings, this time with a different stroke pattern. do them in unexpected ways. remember , the sketch pen strokes should convey some interesting pattern. looks good. very neat. however, you can experiment with color application in a way to bring out the unexpedted way of doing it. 'that' gives a wow factor or a stunning look. what i suggested is take copies of the freehand assignments you have done so far and color them in many diffrent ways using diffrent combinations. dont be afraid of not doing it good. now you need to move from good to great. redo the above assignment incorporating the feedback. You are doing quite good. the color cobination also looks good. 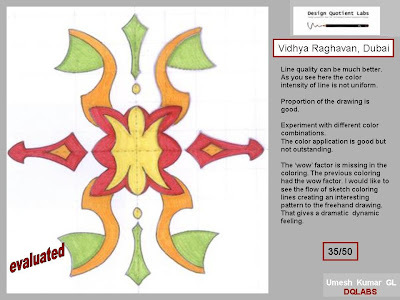 we have almost covered all the topics of freehand drawing and you have done a greatd job. Now attempt mock test-2 freehand drawing. use all the tips you have learnt so far, implement them and submit the drawing by 18th october 2008. this is a kind of test to evaluate you learnings so far. 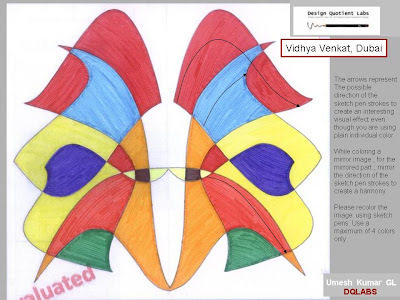 Dear Vidhya, since you said you have taken a similar amount of time for all the three mediums, i suggest you work on using sketch pens as i see you color well with them. when coloring with sketch pens there are both advantages and disadvantages. the advantage is the final outcome is a bright looking attractive painting/ art. the disadvantage is if it is not done carefully/preplanned, the overall image looks very shabby. this is because when you fill the space with a color sketch pen, you can see the strokes of the sketch pen tip. if you do not fill the space in an organized manner it looks very shabby. this disadvantage can be turned to an advantage if you be creative and organized in the way you apply the strokes. follow the feedback in the above image and recolor the drawing. be creative in color application. you can take inspiration from Van Goghs starry night painting. observe how he used the strokes to give a sense of direction to different objects in that drawing. he has used shades of the same color, however for your assignment we use only a single shade for each color. can you write down the time taken to color for each these drawings using different medium. Your freehand lines are satisfactory. i will send you some 'on your own' exercises for your practice. i suggest you to take multiple copies of them and practice atleast one assignment a day. that will improve your freehand lines over a period of time.Focus on line quality. now lets move on to the next step of freehand drawing- Coloring. Use the above sketch and color it in 3 different mediums (color pencils / crayons/ oil pastels / water colors / sketchpens / any other) you are comfortable with. choose an interesting color theme. for tips on color theme read the colors chapter in the book given to you. You got it. now take 3/4 zerox copies of the drawing and practice darkening the lines (both left and right freehand lines) using a baclk sketch pen. submit the drawing which has got good freehand lines. excellent work. please do the next assignment and submit. give due attention to proportion and quality of line. if you get it right the first attempt we will go for next aspect of freehand drawing., ie coloring. all the best. redo this assignment till you get good freehand curves. Practice Practice practice. 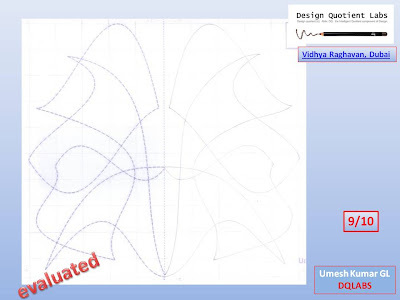 check out http://dqlabs-nata09lsdc.blogspot.com/2008/06/akrti-bangalore.html for benchmarking the quality of freehandlines. Good attempt. the construction lines should be exactly as the ones you have drawn. from now on when ever you need to draw the proportion lines draw them like that. i want you to erase the line that got an X and redraw it to match the mirror image. (dont redo the whole drawing, just erase the line to be corrected and do only thatpart).the line quality can be much better in general. after you do the correction scan it and save the jpeg. now using a black sketchpen retrace the lines you have drawn with HB. give attention to the smoothness of the line. scan and send me both the images. Good Job Vidhya. one suggestion here. while trying to get the proportion of the drawing, it is better not to draw the lines very dark, because you will have to retrace the lines using a B pencil / sketchpen later anyway to darken it and it will be easier if the base lines are every light in tone. the lines you draw for getting the proportion correct can be considered as construction lines, so they beter be very light ok?. now lets move on to the next assignment. focus on both proportion and line quality. here is a tip for you. first use a 2h / h / hb pencil to draw the lines very lightly and get the proportion correct. once you are satisfied with it, scan the drawing and save the jpeg. now use a B pencil/fine tip sketch pen to darken the (construction)lines. at this point of time you need to focus on the quality of the line. complete the drawing and scan it again. send both the scanned images to me. i recommend you not to erase the slave grid / master grid till you are able to get the proportion of the drawing well. please take up one freehand drawing at a time ( which ever you feel comfortable with), master doing it perfectly and then move on to the next one. focus all your efforts and energy in getting that drawing excellent so that you will learn some important aspects of freehand drawing before you go to the next one. let me now which drawing you want to take up and i will guide you accordingly. You need to focus on getting the proportion of the drawing correct. 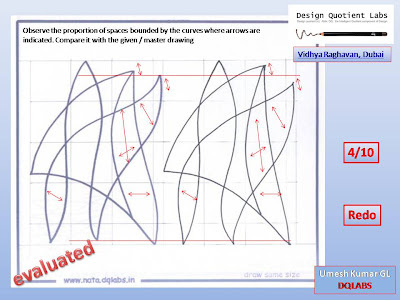 If you observe the feedback above , you will be able to understand how the size and shape of the spaces enclosed between the freehand lines you have drawn correspond to the given drawing. 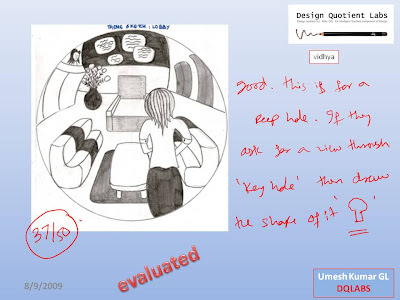 PLease do a similar visual analysis with the other 2 drawings you have submitted. they also contain similar proportion problem. 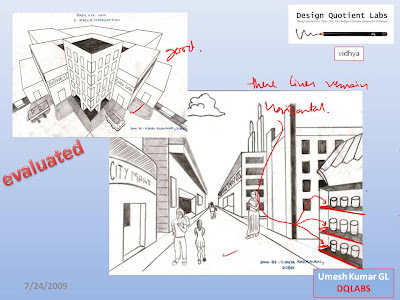 A well proportioned drawing can be acheived by a well drawn/spaced master grid. different students have different comfort levels in using the grid. if you think you need to draw more grid lines closely spaced ( which i feel is very much required in your case) please do so. there are no rigid rules on the size of the grid. the basic purpose of the grid is to get the proportion of the drawing correct. You will be erasing the slave grid later anyway. so draw/ use the grid were ever you feel is required. 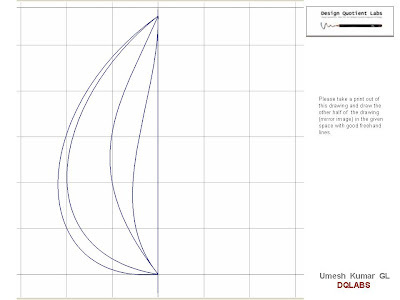 while drawing the freehand lines, you should make sure to closely flow the curve to grid line relationship as much as possible. 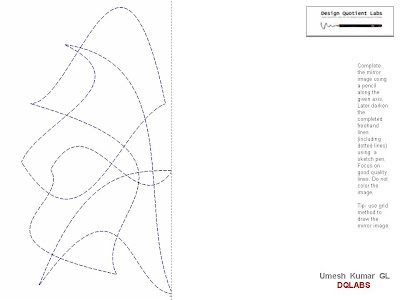 the resultant drawing would automatically be closer to the given question drawing. redo this assignment. get a well proportioned drawing. donot erase the grids for now. later we will focus on the quality of the line. 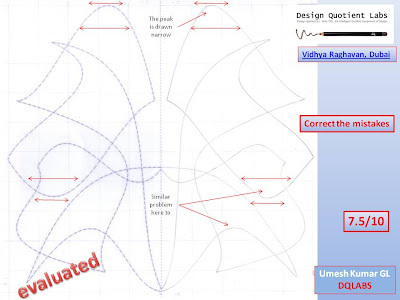 the following is the preliminary analysis on your freehand and sketching skills based on the drawings you have submitted for the first assignment. over all appeal - fair. As we proceed further in this course work you will learn to tackle each one of the above points. we will start with the freehand drawing. PLease read hte chapter on freehand drawing and attempt any 2 freehand drawing question given in the book. Note: For now focus on the proportion and freehand drawing part of the sketch only. coloring will be taken up separately. so you dont have to color the freehand drawing for these assignments till i ask you to do so. submit you drawing by next sunday. if it is not convinent please leave a message in the comment section below quoting the problem and expected date of submission that is convenient for you. I took approximately 45-60 minutes to color each of the sketches in 3 different mediums. I won't be able to submit my current assignment in the forthcoming week due to my first mock exams. However, I'll try to complete it as soon as possible. I sincerely apologize for any inconvenience caused by this delay. no problem. do your mock exams well. I would appreciate it if you could let me know about my next assignment as early as possible. i have sent the next assignment by email. please check it. I sent my assignment today. Did u recieve it? How do I show the depth of the shelf in perspective. decide at what level the shelf would come. if the level is above the eye level ( the horizontal line on which vanishing points lie)...you would see the bottom surface of the shelf. if it is below the eye level you need to show the top surface of the shelf where articles are displayed. the paralel edges of the shelf would be vanishing towards the corresponding vanishing points. try to visualise this before you draw it. if needed make some study sketches of kitchen shelves. Did u recieve my assignment? How do i show the corresponding depth of the shelf outside the panshop? 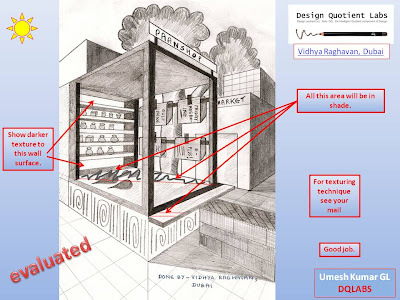 what i ment was, where ever the side of the pan shop is stopping right now, it needs to be extended till the red line as shown in the drawing, inorder to give the depth effect of the shelves. it will still be part of pan shop. the extended surface will be a plain opaque wall / you can draw some advertisement display on it. Can u pls give me an idea on how to draw the corners of the panshop? please refer the sample sketch and tips on the feedback. if you have a wooden table / bed at home study the edges and sketch them. attempt correcting the drawing and send it. if you still have difficulty i will tell you how to draw them. Do I have to correct the mistakes in the previous picture or do I re-do the whole drawing all over again? Could you please give me an idea how to represent different textures? Did u recieve the mall pictures that I sent yesterday through mail? i thinnk i have sent a reply to the mail. please check it. i will try to send you a couple of mall images by evening. do i have to define the sihoutte of the human figures drawn previously or do i draw a new set of human figures again? you can continue with the drawing you have. no need to redraw it again. Did u recieve the assignment that i sent u today morning? I was extremely busy this week due to tests and school work. I will complete and send my assignment by Monday 26th Jan. I'm down with a terrible flu and I won't be able to do my assignment for another 2-3 days. I'm really sorry for the delay. Please excuse me. Oh. take good care of yourself. get well soon. When will I recieve the feedback of the artclass assignment? Since I've been living in the GULF throughout my life, I have a very limited idea about Indian theme sketches and I can't really visualize and draw them. I would be most grateful if you could please guide me through possible sketches based on Indian themes. Besides, I also want to know if the NATA exam focuses on general themes rather than Indian themes. I eagerly await a quick response. I conducted a google search on various indian themes but i didn't get any good images. Moreover, since the website, http://www.flickr.com/ is blocked in the uae, could you please let me know of some other website from where i can download images of indian themes from. Could you pls send me the shapes which I need to use for drawing the 3d composition? Did you recieve the pictures that I had sent yesterday night by mail? I had sent 4 zipped folders. Have you recieved all my assignments that I sent yesterday and today? yes i have received you sketches. please note that Only the drawings that are submitted before 5 PM of a day will be given feedback on the same day itself. Drawings submitted after 5 PM of a day will be evaluated the next day only. so you will get your feedback by tommorow morning. I'll definitely submit my assignments on june 13th as I have my board exams going on. I sincerely apologize for the delay. 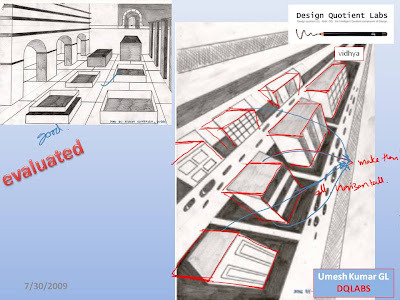 Did u recieve the assignments that i had sent yesterday ie one exterior and an interior view? I'm waiting for your feedback eagerly. Have you recieved my assignment on human figures? When will I get the feedback? I just wanna ask you one thing: have I improved my theme sketching skills? Please let me know asap. 1.perspective concepts thorough understanding. read the book well. 2.obervation and understanding of proprotion and scale of objects and their behaviour in perspective. 3. human figure drawing- try getting hte correct posture. have you recieved the perspective assignments that i've been sending. Yes, the new account is working much better. I'll send the new assignments asap. I wanna clarify a doubt. For the latest 3d composition, do i have to make a sculpture using 5 bricks or can it just be still-life? Besides, which is preferred in NATA? did u recieve my sketching assignments? when will i get the feedback. can u pls just let me know which is the theme sketch - the coconut question or the ant's eye view? since the freehand section is no longer asked in NATA, do i have to practise them before the exam? besides, how long should i take for the theme sketch, 2d and 3d each? moreover, can u give me a hint on how to create a jazzy rhythm? 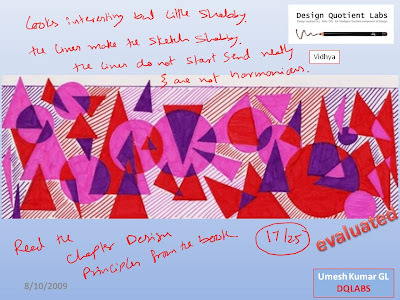 And, do i have to use shapes for the design worksheets to demonstrate the different principles. It is good for practice. it will tune up your ability to draw long immaculate lines. i recommend you to practice it. use one or more elements of design to illustrate the design principles. tghe answer to create interesting patterns lie the worksheets. and congrats on your excellent academic performance! 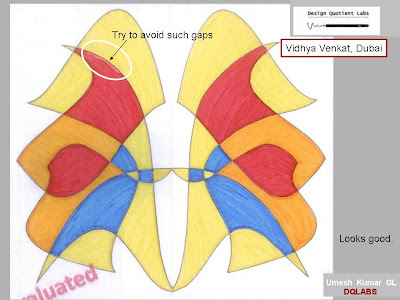 do i have to redo the previous 2d sketch - the sari border? did u recieve my assignments? when will i recieve my feedback?  Make an interesting, unique and innovative composition using the given shapes.  Incorporate all the design principles namely, balance, contrast, pattern, texturing, movement, emphasis, rhythm, unity and variety to add the “wow” factor.  Use bright, harmonious color combinations to make the composition look attractive and lively. 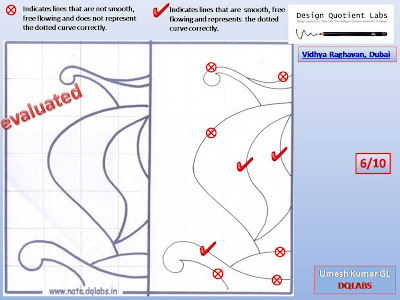  Resize the different shapes and use them as many times as required but use each shape atleast once.  In logos, make the lettering big and bold and the logo conceptuality must be relevant, simple and specific with a minimal of 2 colours.  Incorporate the color theory.  Using all the given 3d objects, create a visually pleasing composition incorporating the use and effect of light and shadows and appropriate shading and texturing.  Overlap the objects to create interest.  Place the 3d objects one on top of the other to disrupt regularity and stimulate appeal.  Be clear about the direction from which light is striking the objects and draw the shadows created accordingly. 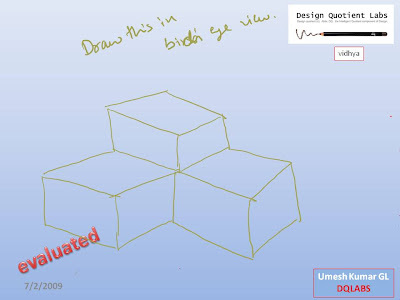  Draw a few 3d objects a little further away to add the effect of distance.  In some cases, the 3d composition can be drawn as a sculpture in extreme bird’s eye or ant’s eye view to generate fascination and break monotony.  If designing a sculpture, arrange the 3d objects in the form of a decorative piece as beautifully as possible in order to arrest the viewer’s attention.  Be as creative and innovative as you can be. 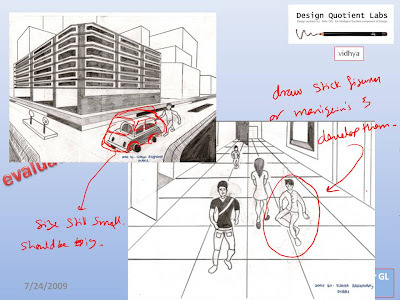 Perspective is one of the most imperative factors in theme sketching. It should certainly be right in all theme sketches. The theme sketch must have one point of interest and relevant details must be added in the foreground to add appeal. The theme sketch should be as realistic as possible. Human figures should be portrayed properly and must be involved in performing an activity which is relevant to the theme. Appropriate texturing should be added wherever required. 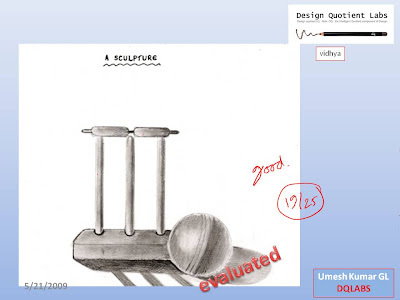 Proportion of all objects in the theme sketch must be correct. 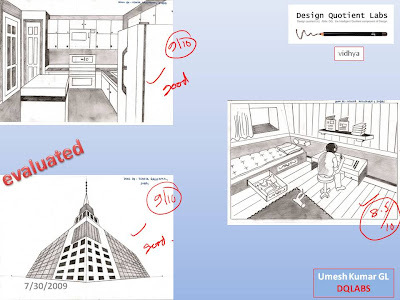 The theme sketch must look complete with an accurate scale and three-dimensional effect of all objects. The theme sketch must have clarity and look as neat as possible. 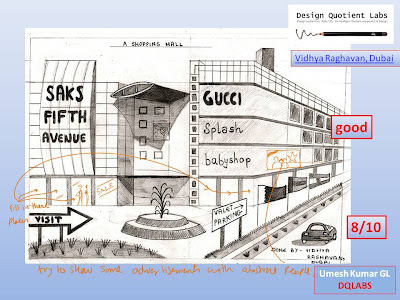 The theme sketch must have a stunning overall look which is often described as the “wow” factor. I think all of Meher’s drawings are truly fantastic and her sketches fit into all parameters of sketching. 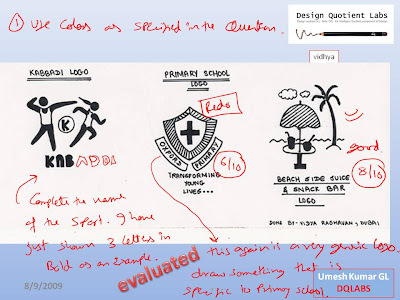  Unique and his sketches convey original ideas. The above is my write-up. Do i have to do any more sketching assignments? And, besides, could you pls let me know how I'm progressing? I just want to thank you for your help, guidance and sincere effort throughout the year. I'll certainly let u know about my NATA exam as soon as it gets over. Great and impressive article.!! Got to learn and know more about web designing. These type of drawing practice will help students to increase their drawing skills. You can also play some interesting hair cutting games to make you refresh. Much informative things are in this blog. Thanks for giving us such valuable blog.